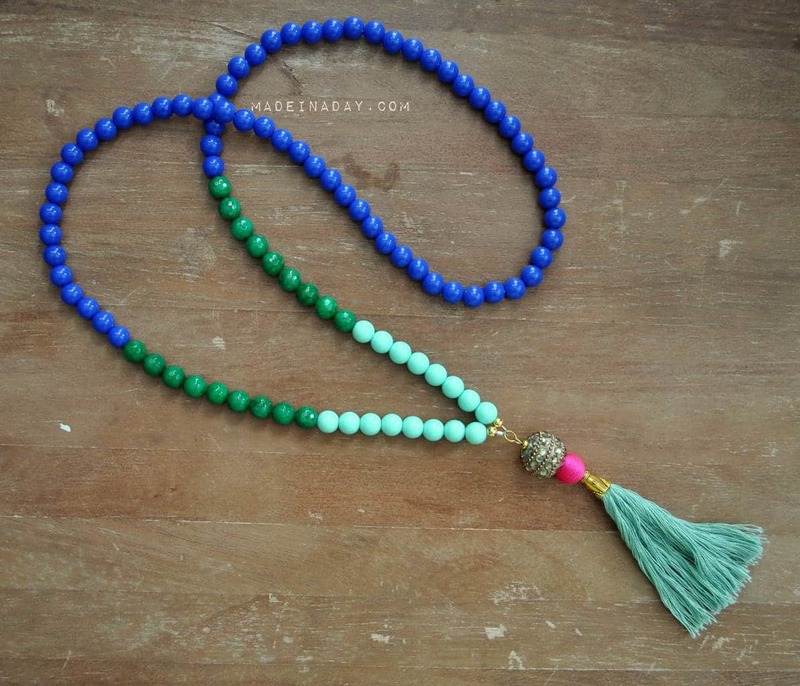 How to make your own DIY Beaded Tassel Necklaces three different ways. Plus how to make a capped tassel. For more tassel projects see my Fashion and Jewelry page. 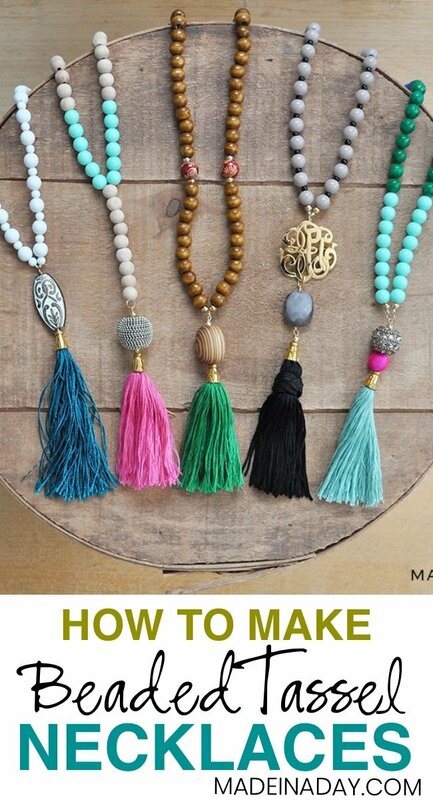 There are lots of ways to make beaded tassel necklaces. The first way I made the necklace is with beading wire, this is my usual way of making necklaces and bracelets. So I thought I would try that first. Cut a long piece of beading wire, around 3-4 ft. Start with a crimped bead on one end, then a small bead and then add your larger beads in various patterns. When you end the necklace, the end will be in the front where you attach the tassel instead of the normal back of the neck area. 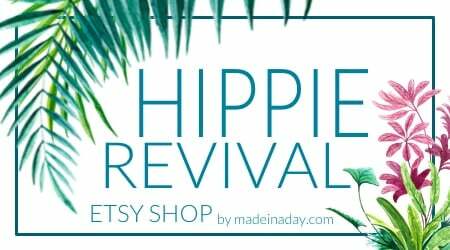 For more details on how to crimp and finish a beaded wire necklace or bracelet see my Bracelet Styling & Restyling post with pics and videos. Then add your tassel with a jump ring. To make the tassels see my Capped Tassel post. Although I liked the strength of the necklace, I found making them with the bead wire made the beads hang wonky on your neck when you tighten the wire to crimp it. It did not lay flat and smooth like a necklace should. 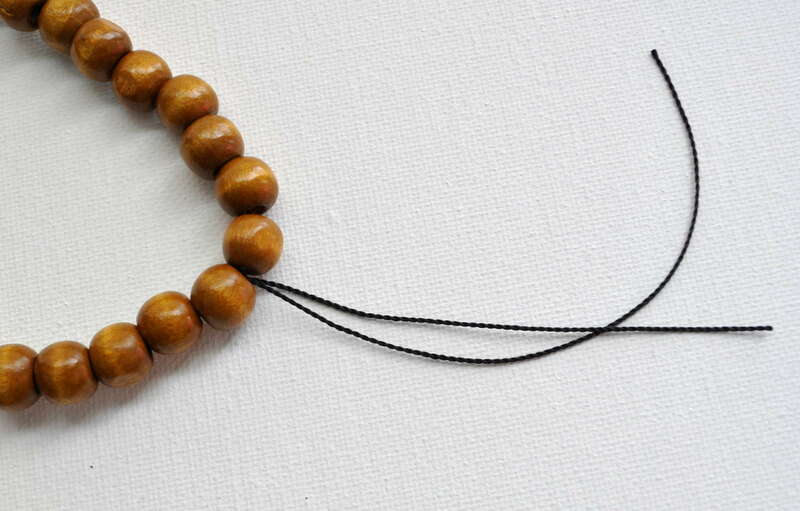 The holes in the beads were made uneven, especially where the wood ones were concerned and they overlap when they are too tightly pulled together. I made a few with the nylon string. Using the string instead of the wire made the necklace hang more naturally (for example the brown beaded necklace with the green tassel in the main image above), with less stress when tightened before finishing. End the necklace by knotting the end of the string and adding a dot of E6000 adhesive to keep the nylon string from unwinding. A waxed coated cording is also a great alternative to nylon string. The wax makes the cording non-slip when tying off the ends. That is another option to use when making these necklaces. 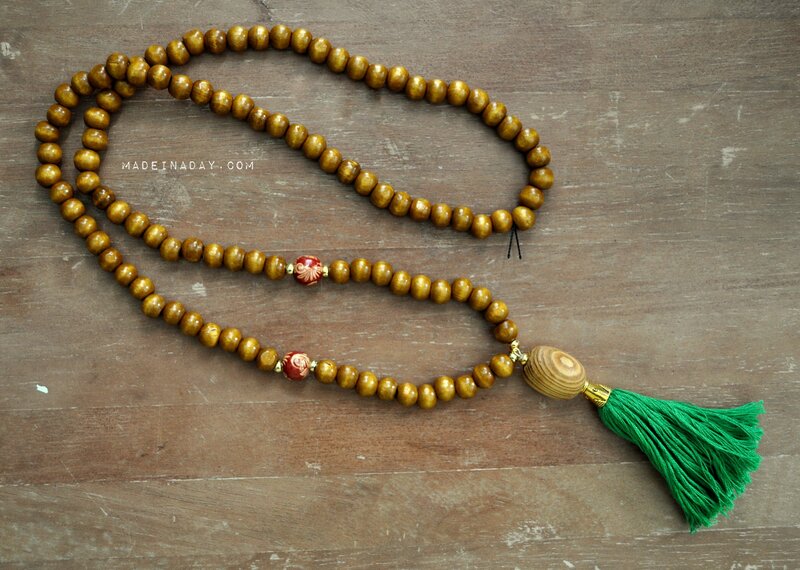 The real way to make the Buddha prayer beads would be to add a knot between each bead as you go. Although I love the way that looks, I really do not have the patience to make that many knots and getting them even between each bead. I hope you enjoyed this post! 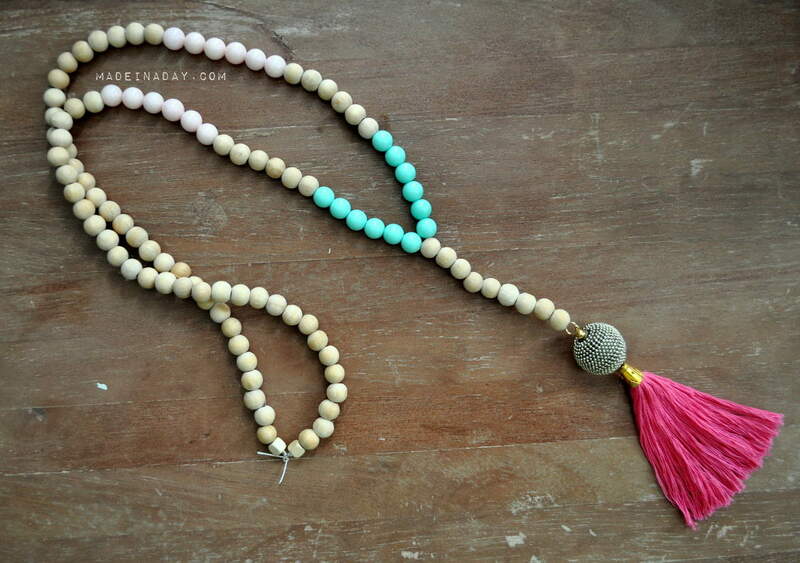 Everywhere I go, I get so many compliments on these DIY beaded tassel necklaces. I hope you will too when you make yours! ~Check out more of my Jewelry Projects! Hi just a quick question! When using the nylon string how do you attach the tassell? I love these btw beautiful! You would add a jump ring to the tassel and string it right onto the string. 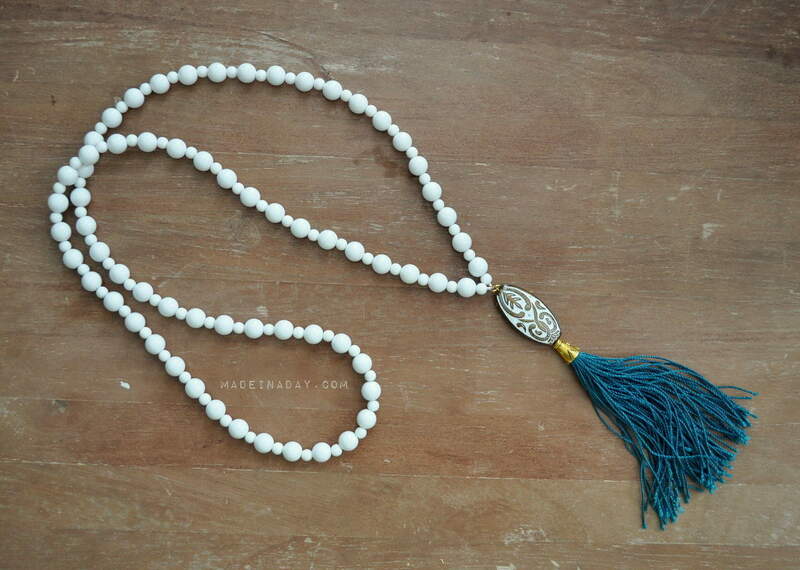 Add beads on either side of the tassel. 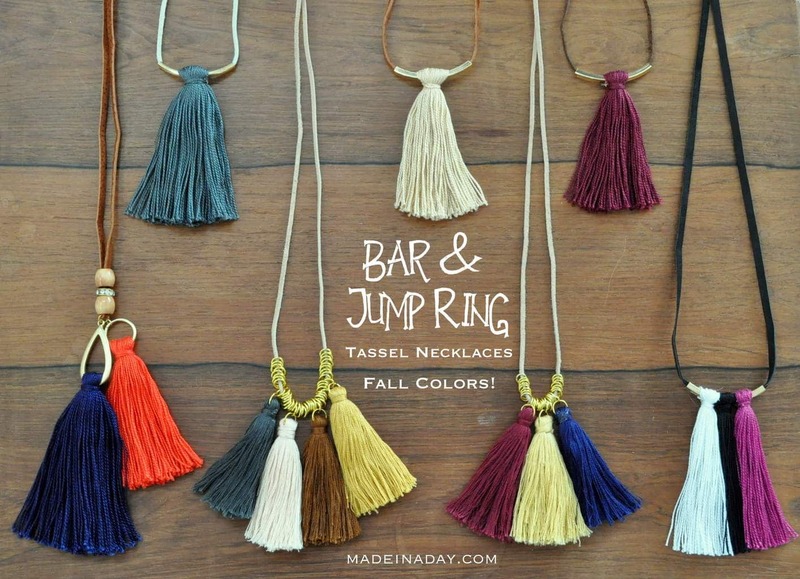 See my capped tassels post on how to construct the tassel for these necklaces. Link to tassels is in the post and below it. Is the black tassel have a monogram attached to it? Can you explain how you attached the monogram? How many necklaces can you make with the materials you mentioned above? Thanks! The necklaces have at least 40-60 of the wood beads each. So buy the beads accordingly. Do you have a tutorial for making tassels? If you have previously answered this question, I apologize, because I did not find it. I added a link in my post to the capped tassel tutorial. It is in the second paragraph in the instructions. Hi! I love these necklaces and your tutorial is super helpful. Where do you find your decorative beads head the tassels? I’m having a hard time finding cute ones? I found some at Hobby Lobby and Michaels. Beads are sold seasonal and by trends so they change all the time. You could also try a store in your area that sells only beads. You can buy them in singles and find unique beads that way. Glad you like my necklaces! Hi I love these necklaces and wanted to try and recreate the one with the monogram. I was just wondering if you know where you got yours or if you could direct me to a place that sells similar ones. Try Etsy.com for them as well. They are monogram pins but they have a loop for necklaces on back too. These are gorgeous!!! I was just wondering how you make the black tassel with the braid around? That tassel is one I already owned. You could try Etsy.com for the tassels if you do not want to make them yourself. 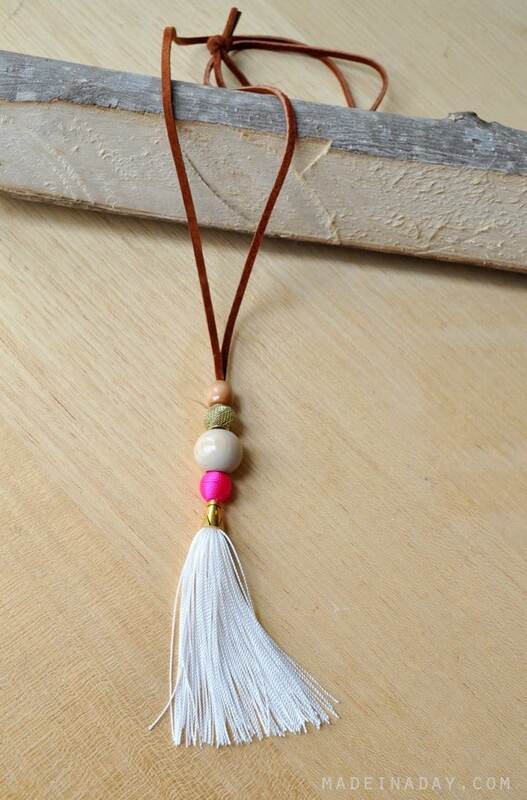 I absolutely love the shape of the pink-tassel necklace. 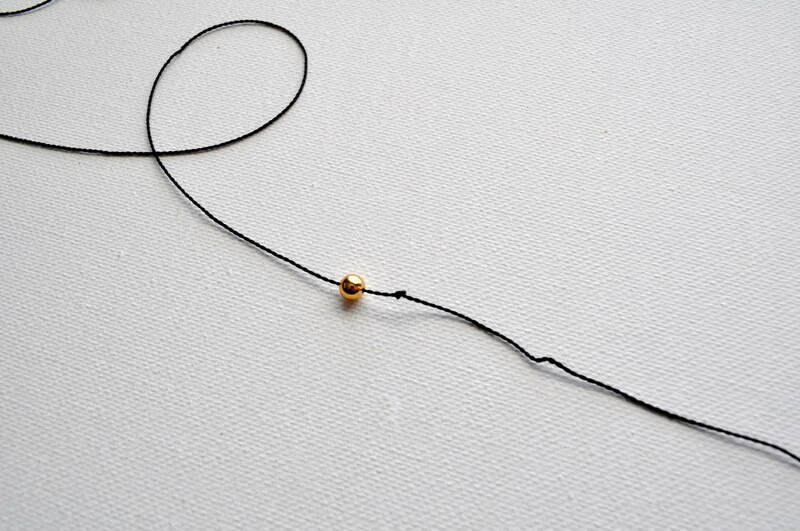 How were you able to get the beads to branch out into the “Y” shape from the original part of the necklace, and then how did you finish it off? Hi Elizabeth, For the Y shape you first cut a long piece of wire/string, add a jump ring to the center and fold the string in half. Feed your first 10 or so beads through both ends of the wire/string. Then after the ten beads split the wire/string and add the rest of the beads to each end. Tie it off with a triple knot and add a dot of glue or end with seed beads and attach ends together instead of adding a clasp, unless you want a clasp, than ad one. I hope that helps! Good luck Glad you liked my necklaces! I so love these!!!! And my daughter will too! Love these. So on trend and perfect for Spring. Featuring when my link party opens up tonight. 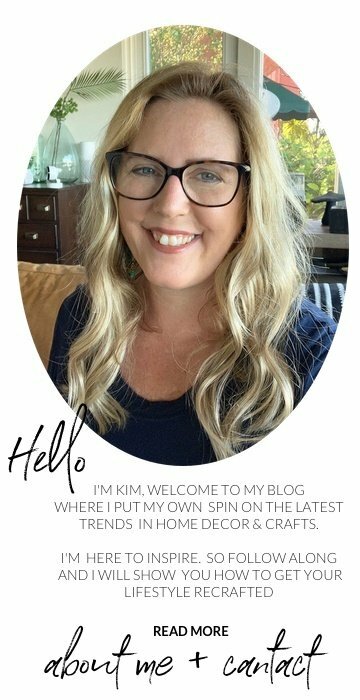 Hey Kim, Your project turned out gorgeous! Thanks for sharing it at the party! Hope to see you again soon. These are absolutely gorgeous! We featured you at the Project Stash Link Party! Kim, these are beautiful!! I’m featuring them today at Creative Spark. Hope you’ll link up with us again this week! These are fantastic! So unique! 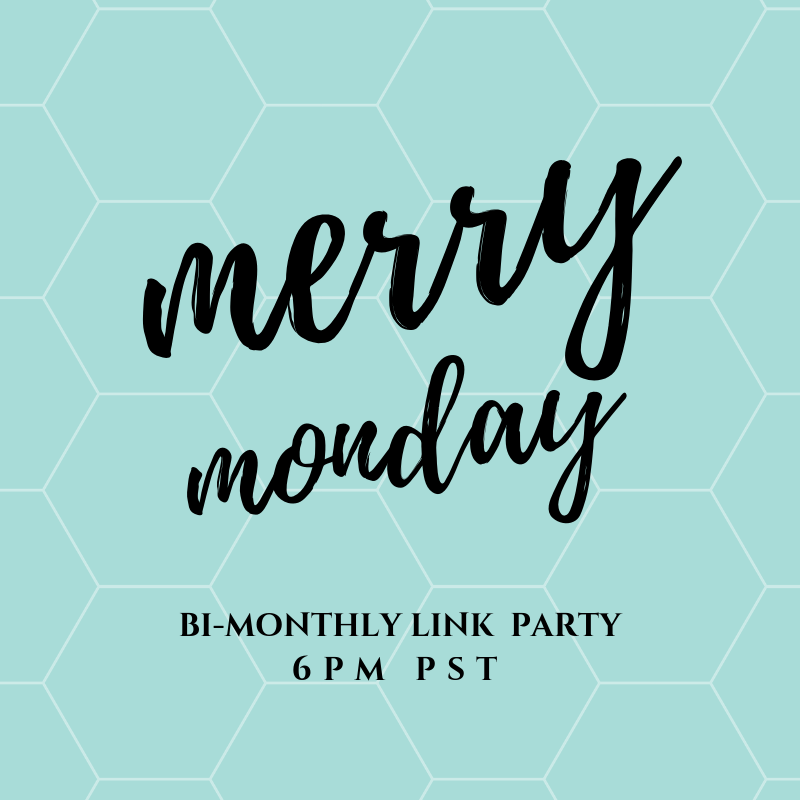 Just wanted to let you know that I’m featuring them at this week’s link party! So lovely!! Featured these at Show & Share today, thanks for linking them up last week! 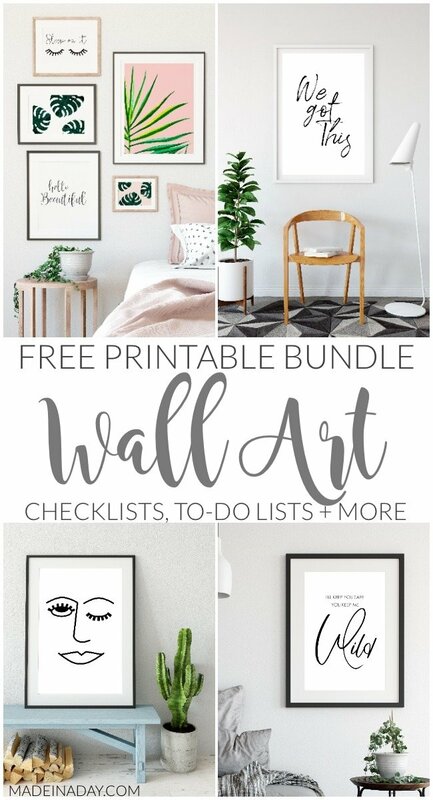 These are really cute and so unique! 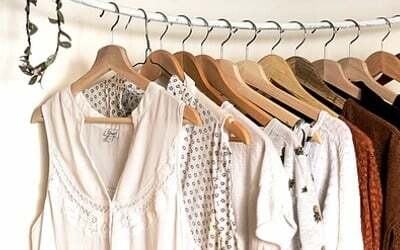 I love that it would be so easy to create a whole collection to match just about anything. um, i looove these! especially the gradient one and the monogram one. amazing! These are so cute – I love the bright colours. I have made a few pieces of jewellery with tassels but I am never fully happy with the tassels so I’m going to head over to your tutorial on that next. SUPER cute!! Thanks so much for sharing with my NO RULES Weekend Blog Party! Ha! I am actually toying with that idea! It just takes so much time to make each one… I’ll let you know if I do! Thanks so much! Glad you liked them! 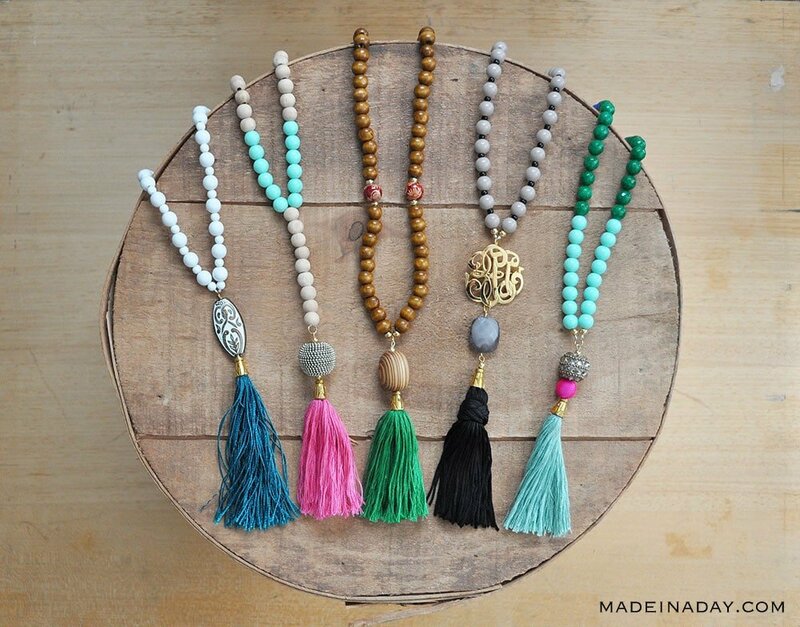 These tassel necklaces are amazing! I love the vibrant colors and the variety in beads! Absolutely gorgeous! Pinning right now. I’d love for you to share these at my Creative Ways Link Party. It just went live at 8pm tonight. Hope to see you there! 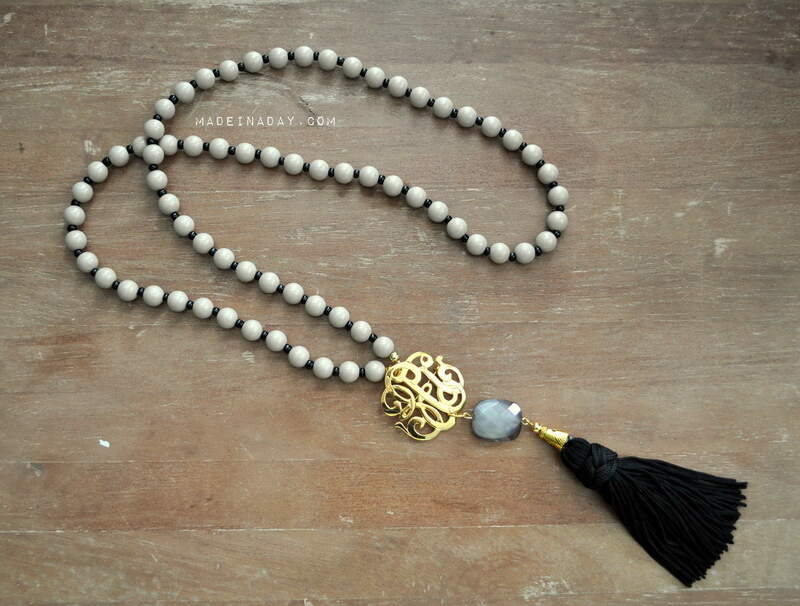 I love these tassel necklaces. I think they are beautiful and gives any outfit that little extra. 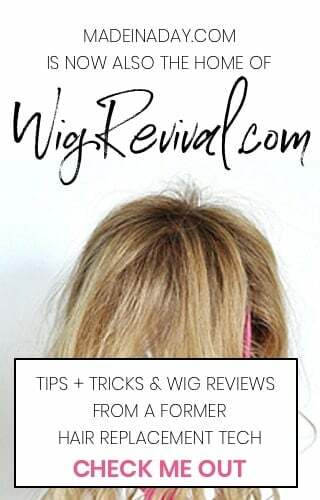 I am stopping by from the Retro Re-pin Pinterest Party I pinned this and the tassel tutorial from your board. Thank you for sharing! Thanks for stopping by Charlotte! Glad you liked my necklaces. Thanks for pinning! I’ve recently became obsessed with tassels too! I’ve been looking for the perfect ones in stores and can’t find just what I’m looking for and you hit the head on the nail! I’m glad you found my tassels! 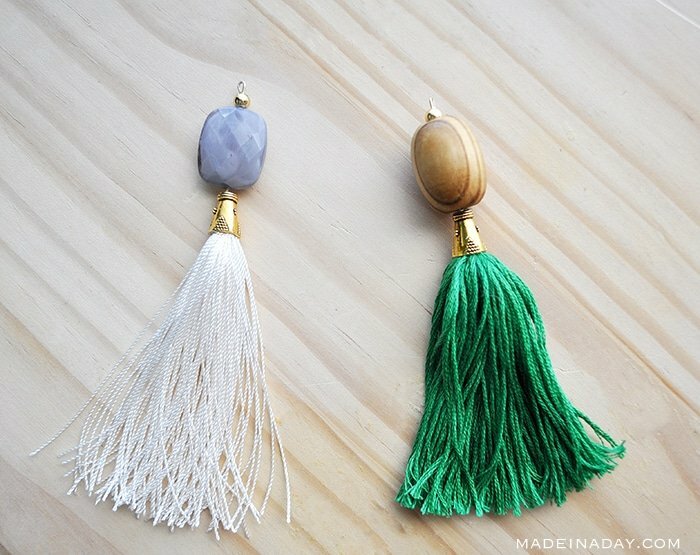 I made mini ones today for another tassel post coming up! So my obsession continues, lol. Thanks for stopping by! these are so pretty!!! thanks for sharing this tutorial!! These are stunning! I would actually make these, thanks for the tutorial!